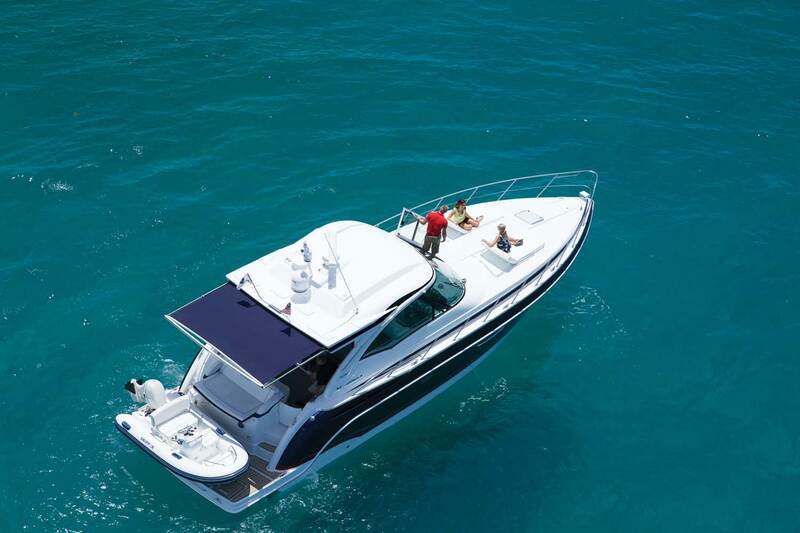 As any boat owner knows, the care of a boat is an ongoing process. If you’re going to venture offshore, you want to be sure that it keeps you going out in the big blue. That’s why boaters tend to take maintenance pretty seriously. It’s important to pay attention to fluid levels and changes, linkages, cooling systems, seacocks, electrical systems, propeller nuts and so on. So that’s why we’re going to talk about canvas in this issue! Ok, so technically, your canvas isn’t necessarily going to keep you in your slip if it’s damaged or missing, but it can have a big effect on the quality of your outing. Leaving your cockpit exposed to the elements is also asking for more trouble down the road. My point is, sometimes canvas care is overshadowed by the mechanical systems of the boat. A little canvas TLC will go a long way toward extending the life and usability of your cockpit cover or bimini enclosure. So, what to do? 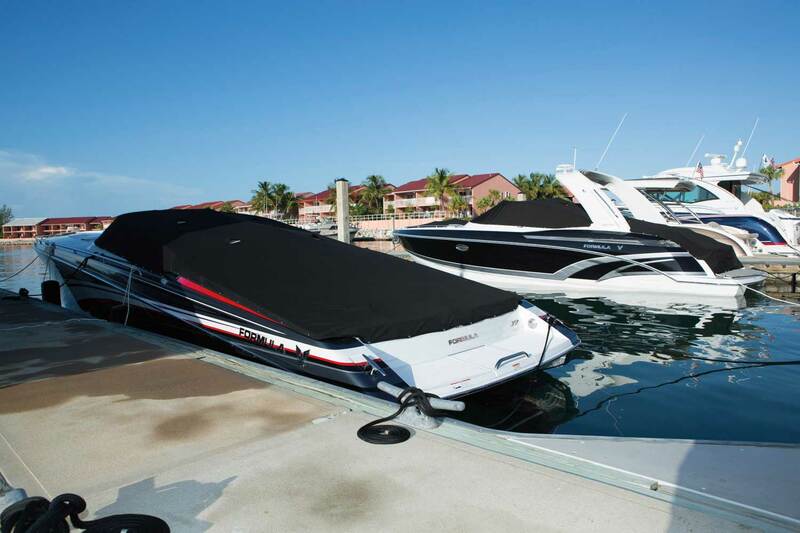 If you’ve been reading Boat Care in the Action for any length of time, you may have noticed a recurring theme by now: If you love your Formula, you’ve got to keep it clean! It doesn’t matter what aspect of the boat you’re talking about-the gelcoat, the stainless steel or the cockpit vinyl. You also need to remember to give the canvas a regular bath-salt air, sandy environments, even dust from storage can wreak havoc if not removed regularly. If the boat is sitting in a slip, it’s still a good idea to hose it down once every week or two, or if it’s sitting in a dry stack, hit the cockpit cover with the hose once in a while before you head out. And if you take your Formula out in saltwater, ever, you know that some of it’s going to end up on your boat-and any exposed canvas. At least give it a thorough rinse when you get back to the dock. If you see that the canvas has progressed to the stage of dirty, where water alone won’t cut it, feel free to use a mild detergent-Ivory soap has been recommended to us by our rep from Ameritex (www.ameritex-tech.com), who makes our bimini top systems, or Iosso (www.iosso.com) makes some good canvas care products. When cleaning, use only a soft brush, and only by hand. And never use a dryer. If you do, you may discover that the canvas has shrunk beyond hope. The curtains-or “glass”-require a bit different care. Windex® can be used, but Strataglass, the manufacturer of the material, recommends the use of IMAR cleaning products. Don’t use harsh detergents (Simple Green, Boat Zoap, etc.) and don’t be tempted to treat the material with Rain-X. It’s great stuff on windshields, but it will develop a haze on your bimini curtains. Whatever you use, clean only with a clean, soft cloth. Don’t use a chamois or paper towels-they can scratch the surface. And don’t forget the bimini frames! These are stainless steel and should be maintained accordingly. Remove the bimini tops from the frames occasionally and clean them of dirt and salt. Check to see that all fasteners are tightened properly and in good condition. 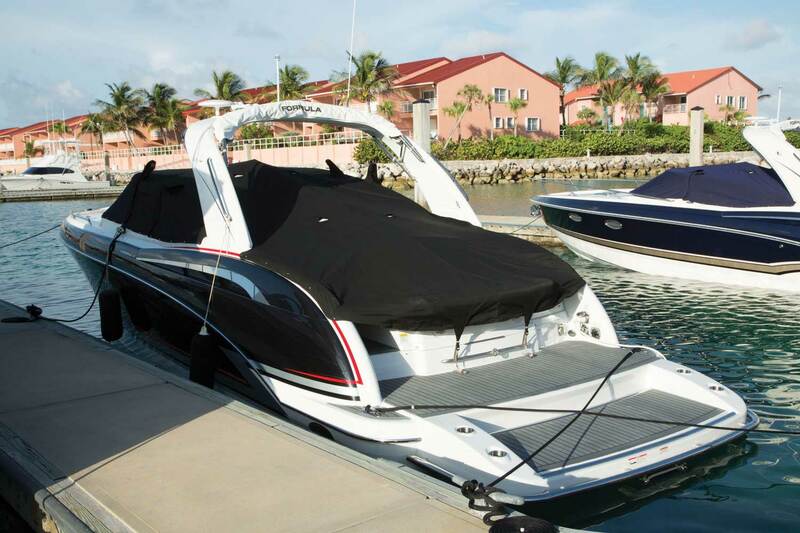 When not in use, canvas and bimini enclosures should be stored in the nice canvas bags that Formula provides. They’ll keep them protected from dirt and scratches, and they won’t be strewn all over cockpit or cabin. Cockpit covers can be folded and tucked away, but you must roll the bimini curtains, particularly the Strataglass-if it is folded, you’ll probably forever know where you folded it, as it will bend and discolor the material. Formula provides a foam cylinder in the storage bag to wrap the curtains around. This will help as a reminder and to keep the glass from being crushed and crinkled. Never store canvas or curtains dirty or wet. Dirty, wet canvas invites mildew, and curtains stored wet will develop a milky haze. If you do and you’re lucky enough to discover it in a relatively short amount of time, you can take some steps to restore its clarity. 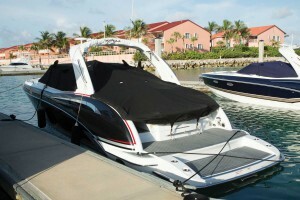 Install the curtains on the boat to dry out and absorb as much sunlight as possible. This will generally bring them back to normal and keep their fitted shape. If you can’t put them up on the boat, hang or lay them on a soft, clean surface in the sun as an alternative. Lazing in the shade of your bimini on a hot summer day or enjoying its protection when the wind is blowing and seas are up sure makes for more enjoyable boating, and a clean, tight, colorful cockpit cover really sets off the rest of the graphics when the boat is docked. Following these pointers will help keep your canvas beautiful and in good working order for seasons to come-don’t forget it before you leave your boat at the end of the day! In the meantime, get out there and have some Formula fun. Good boating!